Posted on June 11, 2017 by Matthew Mahalik. Today was the first of two days in Wyoming that had us pretty optimistic about our data collection chances. While whispers from the models for significant severe weather tomorrow began to grow louder, we needed to focus on a challenging “upslope flow” forecast today. Upslope flow is one of the most common ways to get severe weather in the High Plains. When low-level flow is oriented from the east to west, it is lifted since the terrain slopes upward toward the Rockies. This gradual lift can act almost like a front, lifting surface parcels from the east far enough that they can take advantage of instability and generate storms. This is very common in Colorado and Wyoming and can produce very intense storms, but is often difficult to forecast due to relatively cool and dry air near the surface. 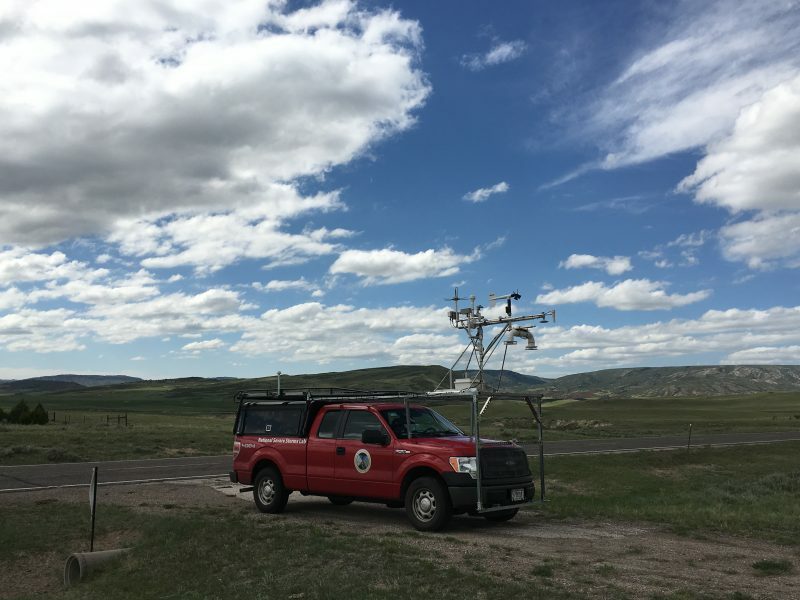 Initial signs pointed to the upslope flow causing active weather off of the eastern slopes of the Laramie Mountains north of Cheyenne, Wyoming. Sometimes though, things change. Overnight, a weak surface low pressure center developed in north central Nebraska, pulling winds in our area around to the northwest (NOT upslope). The result was a loss of several hours of upslope lifting before the wind direction did eventually shift to east. Combined with a slight delay in upper-level energy from a larger system further west, the conditions just never came together as we had expected. This was confirmed by a series of radiosondes we launched, which showed an unimpressive atmosphere and messy (at best) wind shear profile. On the ground, we watched as cumulus clouds struggled to grow over the mountains…a sign things would get no better down on the Plain. We called off all operations in the early evening with nothing to show…but at least the views were pretty! We gathered in Cheyenne with crews from Texas Tech University, Nebraska, and Colorado to prepare for tomorrow, which looks like a busy day.